There’s something romantic about vintage paperback crime novels, from their bold cover art to their larger-than-life characters, gritty urban settings, and action-packed storylines. Hard Case Crime, an imprint created by Charles Ardai and Max Phillips, has tapped into this nostalgic sentiment with a series of reprints that brings a selection of these novels back to life in new, fresh-looking editions. Now, with the publication of The Knife Slipped they’ve taken it a step further by publishing for the first time a lost manuscript in a series of detective novels written under the pseudonym A. A. Fair by Erle Stanley Garner, creator of the famous Perry Mason. Rebuffed, Garner threw the manuscript into a drawer and immediately dashed off another, which his publisher accepted. Turn on the Heat (1940) became the second installment in a series that ran to 29 novels altogether, but thanks to Hard Case Crime, which tracked down the forgotten manuscript sitting in a box of Garner's papers, fans now know that there were actually 30—and for the first time they have a chance to turn back the clock for a rare look at Garner’s early thinking as the series and its characters took shape in his imagination. In The Knife Slipped, Cool operative Donald Lam investigates Eben Atterby, an adulterous crook who uses multiple aliases to sell inside information to civil servants, including police department personnel, in advance of their examinations for promotion. As fans of the series have come to expect, Donald takes a few brutal beatings, falls for the primary female suspect in the murder investigation that emerges from the case, and dodges the police as they focus on him as a suspect. Doggedly, Donald perseveres through constant adversity to figure out exactly why a certain pair of trousers actually points to the real killer after all. In an Afterword entitled “Fry Me For An Oyster: The Apprenticeship of Donald Lam,” Russell Atwood reflects on the development of Donald as a main character and points out what is almost immediately evident to aficionados of the series: that our beloved brainy little shrimp is much different in The Knife Slipped than in subsequent novels. Here we follow a novice detective who makes mistakes, blows surveillance assignments, needs Bertha’s help to figure out what’s going on, and loses control of his investigation by falling for the lovely Ruth Marr. Furthermore, Bertha Cool is much more in charge of things, and much more generous in her dealings with Donald than the strident, tight-fisted quibbler of later novels who’s stingy with expense money, focuses only on how much she can squeeze from clients, and relies heavily on Donald to solve the mystery for her. The Knife Slipped serves as a bridge between the first novel and the rest of the series. After all, Donald was not born a detective but was made into one, and in this lost novel fans have a rare opportunity to consider how he evolved from a disgraced, disbarred lawyer to the calm, confident investigator we now know and love. As for Bertha and the inconsistencies in her character from this novel to the rest, perhaps it’s best just to give Garner a mulligan on this one. Frankly, the less-capable Bertha of the rest of the series is much more loveable than this version, and a much better foil to Donald’s cool competence. Finally, a word of thanks is due to the team at Hard Case Crime for producing yet another jewel in their impressive crown. The cover art could not have come from anyone other than Robert McGinnis, whose work graced so many of those vintage paperbacks back then and who is still producing at the age of 90. 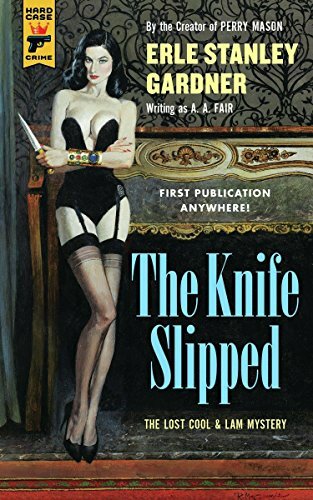 The book design overall is clean and accessible, and the inclusion of Atwood’s Afterword is an acknowledgment that the publication of The Knife Slipped is a gift to aficionados of the Cool and Lam series that deserves explanation and—yes—celebration.